I wanted to design a pretty, feminine ring. This Daisy ring is the result. There are 8 daisies around the ring, incorporating 56 stones. Sean contacted me from Ontario, Canada. He had been searching for the perfect engagement ring for his fiancee-to-be Lisa Dazey, whose nickname is Daisy. He loved the Daisy ring and hoped she would too. He was pretty sure the ring would fit her, so I sent it to him and he surprised her on her birthday with the ring and his proposal. I was delighted to receive an e-mail from Lisa to say that she had of course accepted Sean's proposal, that she adores her Daisy ring and that it fits perfectly. As Sean said - the stars were aligned. Thank you both, I wish you many many happy years together. This ring can be made to order in any size and metal, using sapphires, rubies or diamonds of any colour. 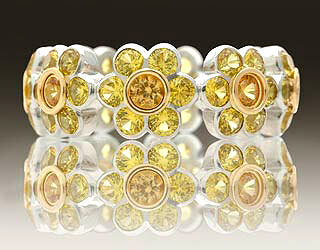 To see some CAD renderings of the Daisy ring with alternative stones click here. Price will vary according to metal and stones chosen. This daisy ring is unlike any other beautiful ring i've ever seen before, let alone called my own! now wearing it on my hand makes me feel like the luckiest woman in the world!! i've received endless praises already about how unique and sparkling my ring is... and what a wonderful surprise to be engaged with it! thank you eva for making such a magnificent piece which found its way to me across the world, i'll treasure it forever! !